Over the last several days, the NCC Blog has attempted to answer some basic questions about the current health care debate, especially as it relates to people with disabilities. How would all this affect home care? We might ask instead, "Why are the Republican health care bills so important to disabled people in a different way from everyone else?" The two-word answer is: "Medicaid" and "home care." We've already talked a bit about Medicaid Expansion, but not about Medicaid itself. Medicaid is a health insurance program operated and funded by the federal government and the governments of each state, covering a wide variety of medical services, mostly for people with very low income people. For the most part, recipients don't pay any premiums for Medicaid. Medicaid, along with Medicare which covers an overlapping population of elderly and disabled people, is the closest thing we have in the United States to a single-payer, government-funded health insurance program. But Medicaid has a special importance for people with disabilities, because it is basically the only insurance that covers home care and a complex, essential array of other disability-specific services, like: physical therapy, speech therapy, occupational therapy, durable medical equipment, and even, in some cases, home accessibility modifications. Those of us who are disabled and on Medicaid not only can't survive without it, we can't live decent lives without it, even if we could, narrowly, avoid dying without it. • Provided in the disabled person's own home and / or other locations in their community, NOT in any kind of institution or facility. When we're talking about home care, we generally aren't including other, equally important, but fundamentally different one-on-one disability services, such as: therapies, home nursing for recovery from acute illness, rehabilitation, or other services that are generally meant to be temporary, while home care is generally intended to be more or less permanent. 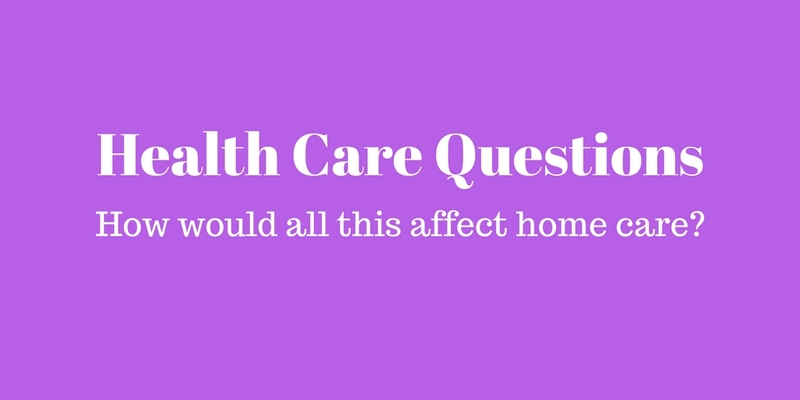 The other key thing to know about home care, is that while it is paid for in a variety of ways, the only consistent and complete source of funding for individual home care is Medicaid. Private insurance doesn't cover home care. Medicare doesn't cover home care. If you are very wealthy, you might be able to pay for home care out of pocket, but very few people can afford to do that over a whole lifetime. There's nothing in either the House or Senate bills that specifically cuts funding for home care ... (but they both would eliminate important related projects, described below). However, by limiting funding to Medicaid as a whole in each state, and setting the amounts available for each state in a way designed to ramp down funding by over $800 billion, both bills put home care at serious risk. Any state could decide to cut or even stop covering home care, if and when their Medicaid budgets go over budget. Since home care is generally not viewed as "essential," (like emergency surgeries, hospitalization, and annual checkups), it would become a tempting target for saving money in a depleted state Medicaid systems. Instead of disabled people having their services based on documented individual need and basic eligibility, they would be pitted against the other, often vastly different but equally compelling medical needs of every other Medicaid patient. Should a hard-up state fund home care, or pregnancy care? Occupational therapy, or cancer screenings? Suitable wheelchairs, or mental health? Every year, potentially in any state, the basic independence and well-being of significantly disabled people would be on the line in grubby, desperate competitions for adequate funding. And make no mistake ... loss or even just reduction disability services would upend peoples' lives, and some people would die. Many of us live independently and successfully, but are just a few hours of daily service from institutionalization, or even death. There's no point sugar coating it. On top of all this, repealing the Affordable Care Act, (ACA, a.k.a. Obamacare), would end extremely valuable programs ... like the Community Choice Option ... that have helped people move out of restrictive and expensive nursing homes, and into their own homes and communities. 1. An initial Senate version of the American Health Care Act ... which is being called by the Senate the Better Care Reconciliation Act, (BCRA) ... was released by Senate Majority Leader Mitch McConnell's office. 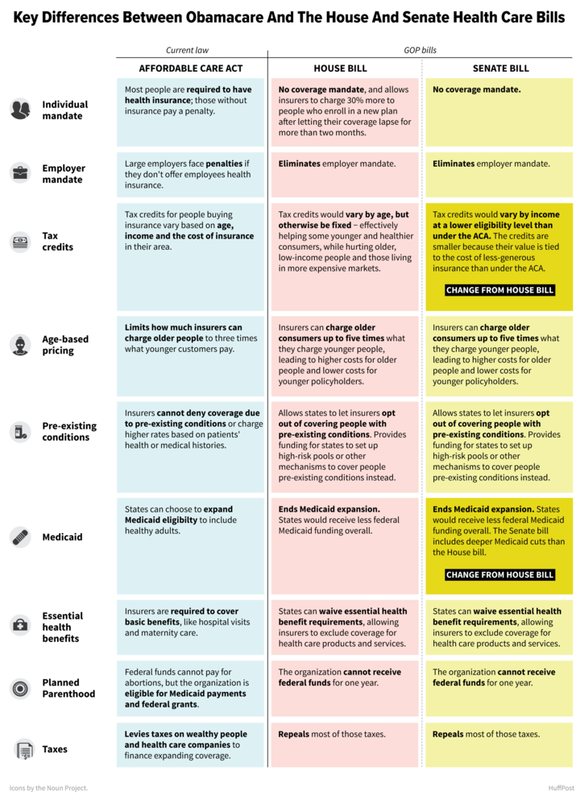 Here are three breakdowns of what's in the Senate bill at this point. 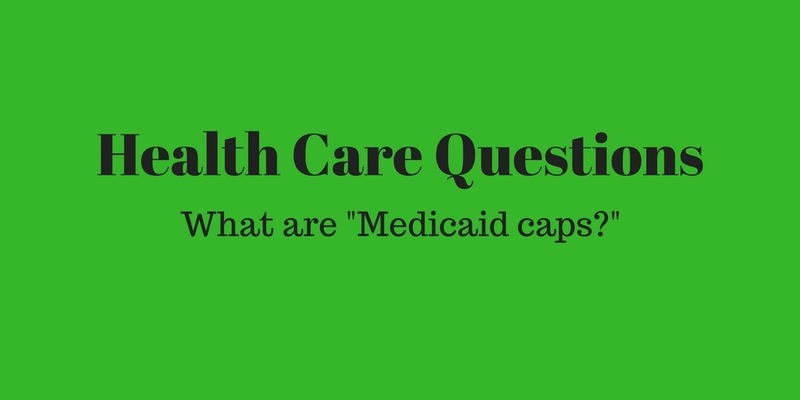 This week, the NCC Blog is attempting to answer some basic questions about the current health care debate, especially as it relates to people with disabilities. • Medicaid is a federal entitlement. If you fit the criteria to qualify, and you sign up, then you can get whatever health care services you need. This may be limited by what your state will and won't cover, and what your doctors think you need, but it's never limited by a federal budget or how much health care other Medicaid recipients need. The amount the federal government spends on Medicaid depends entirely on how much health care Medicaid recipients need. • One of the core elements of the American Health Care Act, (AHCA, a.k.a. : Obamacare), is to fundamentally change how Medicaid is funded, by capping the amount of money the federal government will give to each state for Medicaid each year. Formulas for this vary, but what's been proposed so far would not only limit Medicaid, but significantly reduce it, by over $880 billion over ten years. • If federal Medicaid is capped, then each state would get a set amount of Medicaid funding each year. If needs are less than that, then fine. If they are more, then states wold have to figure out how to pay for them. • This would create enormous pressure on states to cut back on services considered "extra" or "nonessential," like home care, community supports, physical therapies, etc. You can't subtract over $880 billion from Medicaid and expect no reduction in services. Waste, fraud, and abuse is at most a tiny fraction of that. • In addition, the proposals so far would intentionally formulate the Medicaid caps to bring about substantial reductions in Medicaid into the future ... over $880 million over the next 10 years. The Republican's Senate bill might extend that time period a bit, or slightly reduce the cut, but the fundamental hit will remain. • Limiting and cutting Medicaid ... and shifting more responsibility for it to the states ... would not be an unintentional side effect. Medicaid cuts and limitation are core goals of Republican health care policy. Tomorrow we'll look at the affect Medicaid caps and cuts would have on the lives of people with disabilities. 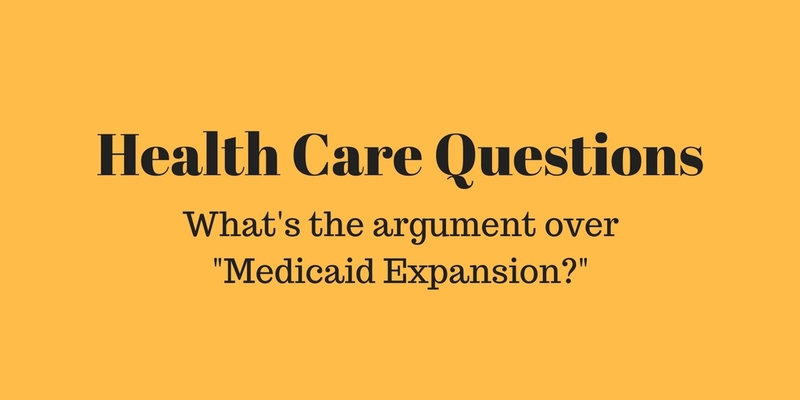 Health Care Questions: What's the argument over "Medicaid Expansion?" Monday: What's going on? And why? Tuesday: What's the deal with "Pre-Existing Conditions?" • One of the provisions of the Affordable Care Act, (ACA, a.k.a. : Obamacare), was a program that enabled states to expand Medicaid to cover people with slightly higher incomes ... individuals with income up to 138% of the poverty line. • This enabled about $14.5 million more people to qualify for Medicaid who couldn't before ... many of them working people without employer-provided health insurance, too much income to qualify for Medicaid previously, and not enough income to pay for individual insurance on the Affordable Care Act markets. • The House version of the American Health Care Act would phase out the Medicaid Expansion over a period of x years. This means the federal government would gradually ramp down and finally stop compensating states for coverage of the newly added Medicaid Expansion enrollees. In order to keep covering these people, states would have to find a way to pay for it on their own. • The Senate version of the AHCA will probably include the same phaseout of the Medicaid Expansion, except possibly sooner, or later, depending on how negotiations between Republican factions in the Senate turn out. • Some Republicans and conservative policy thinkers have been saying that Medicaid Expansion under Obamacare actually harmed people with disabilities, (see Christopher Jacobs article below). The argument is that adding more people to Medicaid took resources away from disabled people, causing waiting lists for services. This is completely false, since Medicaid Expansion was paid for by additional federal money, and therefore took nothing away from any other Medicaid recipients. • On the other hand, if the AHCA does end the Medicaid Expansion, it would create a new funding crunch for participating states, since the federal funding for it would disappear. This could contribute to disability-related services being cut or curbed. Health Care Questions: What's the deal with "Pre-Existing Conditions?" 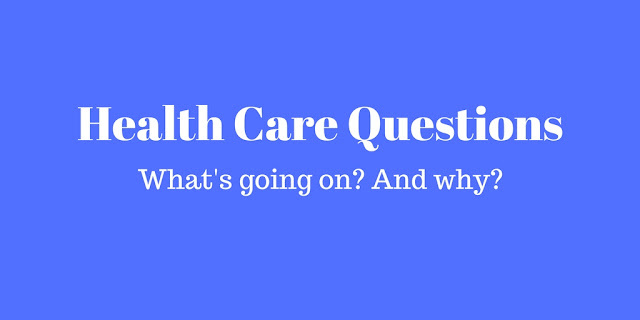 Over the next several days, the NCC Blog will attempt to answer some basic questions about the current health care debate, especially as it relates to people with disabilities. Read the first post here: "What's going on? And why?" You hear a lot about "pre-existing conditions" in all the recent news about health care. So what is it everyone is talking about? • Pre-existing conditions are medical conditions a person has ... or had ... before signing up for health insurance. • This is relevant to people with disabilities, because often, disabilities are pre-existing conditions. If you have had M.S., or paraplegia, or Down Syndrome, or some other disability before signing up for a new health insurance policy, the company will probably regard it as a pre-existing condition. • Until recently, health insurance companies often refused to cover people with pre-existing conditions, or else charged them much higher premiums. The main reason for this is that they consider people who have been sick, or who have significant disabilities, as likely to cost a lot more in health care than "healthy" people. Many, if not most disabled people will cost more in health care than they will ever pay in health insurance premiums. • Under the Affordable Care Act, (ACA, a.k.a. : Obamacare), health insurance companies are no longer allowed to refuse to cover people with pre-existing conditions, or charge them more for health insurance. • The House's American Health Care Act, (AHCA), Includes an amendment that would not outright reverse this policy, but it would allow states to apply for a waiver, allowing them to permit insurance companies to charge higher premiums to people with pre-existing conditions. This sounds complicated! What's it actually mean? • With moderate incomes ... lower income people usually qualify for Medicaid. • Who are young people leaving their parents' insurance. • Who are either unemployed or in entry-level jobs that don't include group health insurance. • Who lose their private insurance, but can't qualify for either Medicaid or Medicare. The House bill also includes something called "high risk pools," which would directly fund health insurance for people with pre-existing conditions who are shut out. The problem is that historically, high risk pools have been under-funded, and they are extremely vulnerable to budget cuts and neglect. Most people with disabilities don't fit neatly into secure, generous benefits programs. Most of us at one time or another fall between the cracks. Yet, most of us can't afford to go without health insurance, even for a few weeks. Tinkering with the pre-existing condition rules, even without fully repealing them, is a very risky thing to do, and the consequences are potentially enormous. Does new version of the AHCA protect coverage for pre-existing conditions? Starting today and continuing through the week, the NCC Blog will attempt to answer some basic questions about the current health care debate, especially in relation to people with disabilities. "What's going on? And why?" The American Health Care Act (AHCA) passed in the House on May 4, 2017. The Senate, under Republican leadership, is working on its own version of the bill. To become law, it must pass the Senate, then the two bills would have to be reconciled, passed again, and sent to President Trump to sign. • Capping Medicaid, which means making it a limited, budgeted program rather than an open-ended federal entitlement. • Cutting Medicaid by over $880 billion in 10 years. • Letting states allow insurance companies to charge higher rates to people with pre-existing conditions. • Phasing out the Medicaid Expansion, which allowed people with slightly higher incomes to qualify. • Ending the Community First Choice program which supports home and community based services. • The Affordable Care Act, (ACA, a.k.a. : Obamacare), was unpopular from the start. Despite reducing the uninsured rate to an historic low, the ACA has had recent problems with high premiums and lack of insurance providers in several states and regions. • Obamacare is deeply despised in particular by Republican and conservative lawmakers, who view repealing it as top long term political goal, and a core promise they made to their voters. • Conservatives generally oppose government involvement in health care on principle. Republican control of the House, Senate, and Presidency have created a rare opportunity to not only repeal Obamacare, but also to drastically cut back longstanding government health care programs like Medicaid. • Although the two goals aren't formally connected, it's worth noting that if and when the AHCA is passed and made law, the Trump Administration's next big priority is to pass massive tax cuts, especially for higher income Americans. In summary, the current debate is influenced by a combination of partisan political ambition, ideology, greed, and ... to some extent ... an genuine need to make health care better, more affordable, and more equitable. • So far, the AHCA bill is very unpopular with the public, while the ACA ... Obamacare ... has become a good deal more popular after the November election, when President Trump's election made repeal more likely. • The Congressional Budget Office, which analyzes the costs and benefits of all bills in Congress, estimates that the AHCA would result in 14 million fewer Americans having health insurance over 10 years, while the federal budget deficit would decrease by $337 billion. • Senate Republican leadership hopes to pass the AHCA by July 4th, and is apparently bypassing the usual committee and hearing process, hoping to come to an agreement in secret, and get it passed quickly. 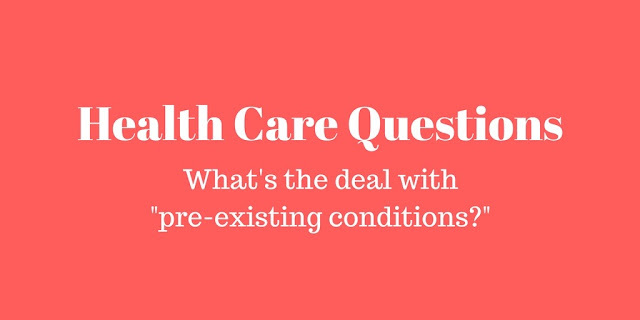 Tomorrow's health care question: What's the deal with "pre-existing conditions?" 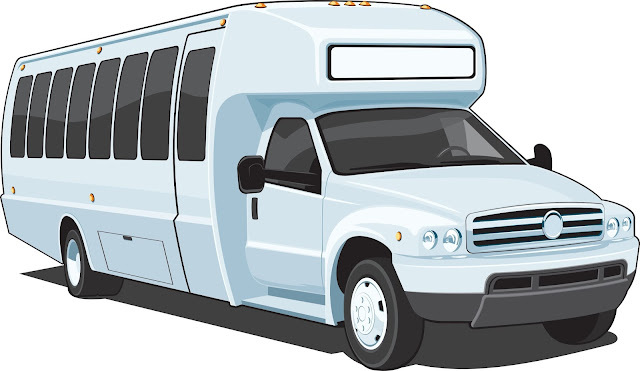 The Clinton County Legislature Transportation Committee voted last night, June 12, to have the Planning Department draft a written plan for proposed elimination of paratransit in "greater Plattsburgh." The Committee also agreed that there will be further public comment meetings on the plan once it is written. We will let everyone know as soon as the Planning Department has a completed written plan, possibly in July, as well as how and when the public can comment on it. In the meantime, you can still sign the online petition, and encourage others to sign it as well ... especially people with disabilities who use Clinton County paratransit. The Clinton County Planning Department's proposal to eliminate paratransit has generated a lot of concern and advocacy activity. People with disabilities who rely on paratransit wonder how they will be able to navigate the regular routes. The buses are accessible, but here in the North Country at least, fixed routes don't cover much territory, even with route deviation. And in the middle of winter, or a summertime downpour, a "short" jaunt to a bus stop is often way too much for a wheelchair user, blind person, or someone using a cane or walker. The Clinton County Legislature's Transportation Committee will meet on June 12 to make a preliminary decision on what to recommend to the full Legislature. What can you do to let your view be known? • Contact your Clinton County Legislator. • Attend the June 12 Transportation Committee meeting, which is open to the public. • Write a Press-Republican Letter to the Editor.